The Colombian Sawback Machete series by United Cutlery offer thick, black-coated stainless steel blades with full-tang construction that not only look mean but can take a beating without losing their edge. 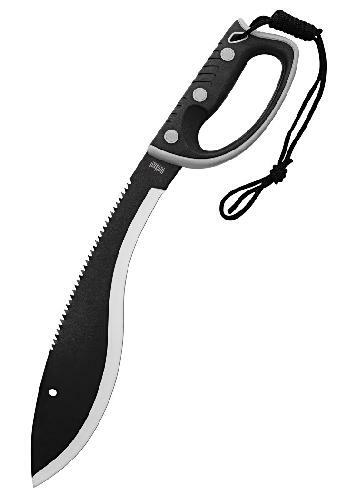 Each machete features a durable injection-molded handle for a firm, slip-free grip in both wet and dry conditions and comes with a molded nylon sheath. Each one of these exclusive blades is guaranteed to perform in even the toughest of conditions! This approx. 53 cm long Kukri machete is the perfect hiking, hunting or camping companion. Its compact size fits easily into a tool box or canoe, but the approx. 37 cm blade is still a force to be reckoned with. Its classic kukri curved blade design has been well-proven in the toughest of jungles for hundreds of years. But United Cutlery has added another great feature: The sawback serrations allow extremely accurate cuts for survival shelter building and other meticulous chores. The injection-molded handle offers a secure and comfortable grip, while the knuckle guard protects your hand from briars and the paracord wrist lanyard ensures it won't stray far. Delivery includes a durable, riveted nylon belt sheath.